How communities—especially in the United States—created, ostracized, and condemned the idea and reality of the ghetto. For more than 500 years, urban societies have found ways to coerce, compel, and otherwise force perceived undesirable groups into their own isolated and sometimes literally enclosed areas of cities. These areas, known as “ghettoes,” most often served to separate Jews from the rest of the population. 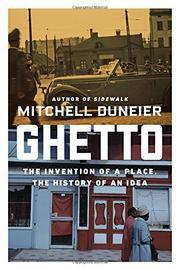 Yet today, when Americans hear the word “ghetto,” they are most likely to associate it with the African-American “inner city.” In this fine book, Duneier (Sociology/Princeton Univ. ; Sidewalk, 1999, etc. ), a sociologist who has a knack for writing for general audiences, examines the history of the spaces that came to be called ghettos as well as the concept of them. In the first chapter, the author clearly shows the long history of the ghettos that emerged in Europe to isolate Jews, and he emphasizes the way the Nazis brought the stigmatization of Jews to its most extreme manifestation. He then follows with a series of chapters that alternate between Chicago and New York’s Harlem and the individuals who confronted the emergent ghettos in those cities. Duneier effectively merges scholarship with a journalist’s eye for detail and compellingly reveals the myriad ways in which the ghetto has come to embody the fears and failures of the societies where they have manifested. However, given that he notes how it is ahistorical to associate the idea of the ghetto primarily with black Americans since American ghettos make up only about 10 percent of the 500-year history of their existence, it is curious that roughly 90 percent of his book is devoted to precisely that anachronism. An expansion of the themes of his first chapter would have strengthened the book. Nonetheless, this is accessible historical sociology that deserves a wide readership. Americans did not create the ghetto, but in this well-documented study, we see clearly how those urban areas have come to embody so many of our shortcomings when it comes to matters of race.